Edible journey to The Biscuit. Well, Sonny, that's a great question... and considering you're coming from Mountain Home, you're taking a very musical culinary journey. After all, Arkansas has many treasures -- and the preservation folk movement centered in Mountain View and Helena-West Helena's location at the heart of Blues nation make this a fantastic trip for music lovers. Enough with the flowery speech. Sonny, here's a list of recommendations to get you from point A to point B and through the festival itself. Heading out from Mountain Home -- the more direct, curvier route will take you through Melbourne, where a stop-in at American Burger Center is suggested. The name belies the contents of the menu -- though there are a lot of burgers available, ABC is just as well known for a biscuit-topped chicken pot pie, a shepherd's pie, fried pork chops, chicken fried steak and Jack Daniels glazed chicken fajitas. Breakfast is great, and they actually serve strawberry shortcake the way it should be served -- strawberries sliced with cream over fresh baked biscuits. Check out the Facebook. Family Restaurant in Ash Flat. Speaking of biscuits, if you're going to go the other way and head to Ash Flat, you can find the biggest biscuits in the state at Meacham's. Formerly BJ's Drive-In (way back in the 1970s), it's named for the family that runs it. Dishes are made to order, so don't be in a hurry. You'll be rewarded with good home cooking and wheaty and soft biscuits perfect for sopping up cream gravy. Or honey. Either way, head south to Batesville and take Highway 167 south to Bald Knob... where epicurean delights await at Who Dat's. We're talking big Creole style seafood platters, a food bar that's plenty for any meal and some mean seafood gumbo. Also, big burgers -- but who goes to Who Dat's for dat? Bulldog Restaurant in Bald Knob. Or do the classic drive-in and stop at The Bulldog Restaurant. Sadly, it's not strawberry shortcake season (you can only get that when berries are coming out of the fields) but the coconut meringue pie is an acceptable substitute and there's a full range of ice cream desserts available, too. The burgers are great square patties on round buns, a true griddle-style burger that's fantastic. Fried catfish sandwich at Gene's Barbecue in Brinkley. 33 down towards Brinkley, make a spot in your trip for a layover at Gene's Barbecue. 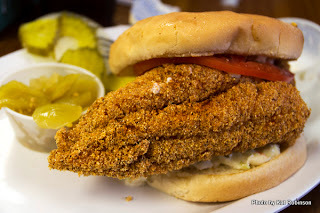 The 'cue is okay, but the fried catfish sandwich is even better. Gene's still believes in the ivory billed woodpecker, old radio hits and pickled stuff -- and picking up a jar of whatever's on top of the pie case isn't a bad bet. Inside Kelley's Restaurant at Wynne. If you choose to head due east on Highway 64 to Wynne, you should think about stopping in at Kelley's Restaurant. Located within spitting distance of the right-hand turn onto Highway 1, it's a family affair with an excellent buffet and good pie. Another good choice -- Colby's. This great community restaurant offers everything but the kitchen sink. The burgers are adaptable, tenacious and juicy, there's always a good dinner choice available and the eatery offers some of the best fried green tomatoes around. Down in Forrest City, once you've passed under I-40 there's a street off to the right that will take you to The Old Sawmill Cafe. Some say the idea of the place is similar to Cracker Barrel -- but the original shop Lib Bell started opened its doors in 1939! Great breakfast bar, good place to sit and relax and watch the traffic go by. About a mile down on the left side of the road you'll find Nana's Diner. Yes, food is good, but you really need to just stop for pie. They make great pie. Now, folks in the know will tell you just keep moving, especially if you're moving early in the morning. Keep on moving right down to Marianna and turn off Highway 1. You'll take a left on Chestnut, a right on Alabama right before the railroad tracks, then a left a bit down the road on Louisiana. Nearly two blocks later on the right, you'll see the two story whitewashed building emitting the scent you've been following for miles. 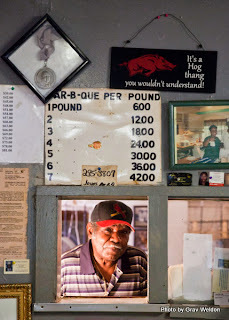 That's Jones' Barbecue Diner, and if you have arrived early enough (and since others will be coming, that early enough means maybe eight or nine in the morning) you can get yourself a three dollar pork barbecue sandwich with or without slaw from the only man in Arkansas who has actually won a James Beard Award. That's right, Jones' Barbecue Diner's been named an American Classic, and if you ask politely Mr. Harold Jones will take the medal off the wall and show you. If it's after noon or if Mr. Harold's out of 'cue, head out towards Mississippi River State Park and stop in at Cap 'N' Jack's at the triangle... and have yourself some of this. Kim calls it Duck Tail Fudge, and it is too much. Dream-makingly good. So, you're heading down Highway 1 or Highway 49, either way, right down into Helena-West Helena. I'm certain you'll want to stop for a burger and some pie, right? 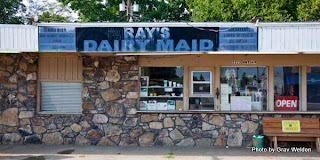 And one of the best pies ever has to be Nana Deane's coconut pecan pie at Ray's Dairy Maid in Barton. I mean, after all, Alton Brown stopped in. Though, if you're coming in close to festival time, you might call your pie order in before you get there to make sure you've reserved a slice. Once you get into Helena-West Helena, look for this sign on this little drive-thru. It's not a joke. This is Burger Shack, and from any estimate I've been able to determine, it's not just the best Coca-Cola in town, it's the best Coca-Cola in the state. The lines are clean and it's sparkly and delightful. You can add flavors, but who's got time for that? Also, umpteen gagillion flavors of soft serve. 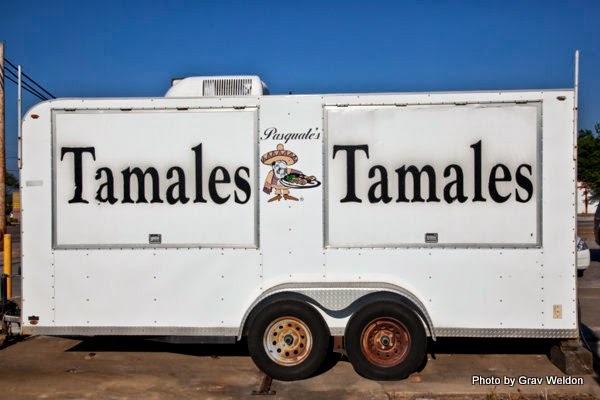 It's where you can obtain those marvelous Pasquale's Tamales -- a tamale brought down through the St. Columbia family passed down from Peter St. Columbia -- who came all the way from Cefalu, Sicily in 1892 and who ended up settling in Helena. 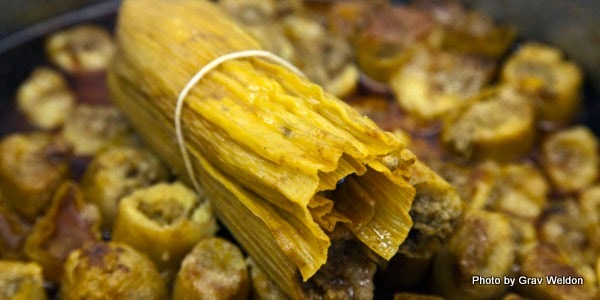 He learned how to make tamales from Mexican immigrants who came to work the cotton fields. The recipe was perfected in a little soul food cafe rented out to a lovely couple who gave it their own twist. 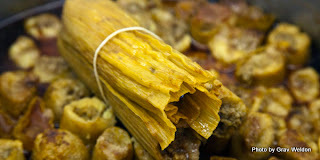 The prime beef tamales developed through Peter and his son Pasquale (called Sam) and through that restaurant and on down the line to grandson Joe, who's still making them with his wife Joyce today. They're excellent -- but you'll love them even better if you get a mess of them with chili and cheese and onions and peppers. And then of course, there's the food of the biscuit. I took a series of photos at last year's festival. You won't have any trouble finding good food on Cherry or Walnut Streets... just remember to stay hydrated, relax and enjoy yourself. Thanks, Kat! Sounds like I could just eat my way to Helena. 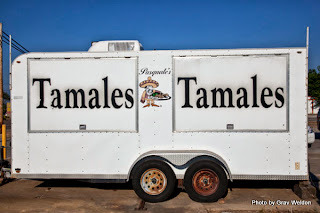 Definitely planned on looking for Delta tamales, now I know where to find them. Will have to stop at Ray's and The Burger Shack, too. Melbourne and Ash Flat both would make great day trips. Appreciate the tips! You have a heck of job travelling the world. Where can I apply? 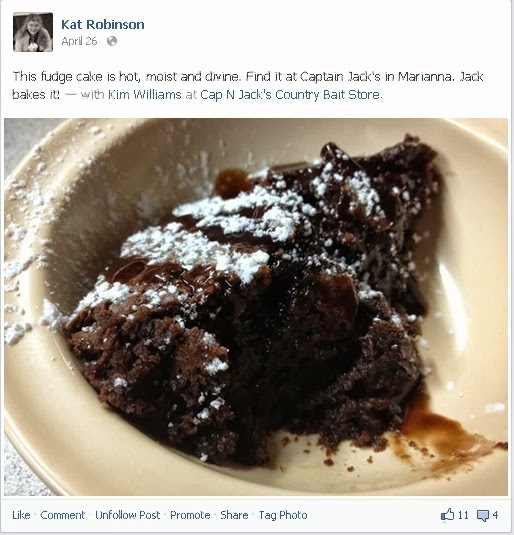 Master Chef in Harrison: Throw it in! Championship Pies at Nima's Pizza in Gassville. 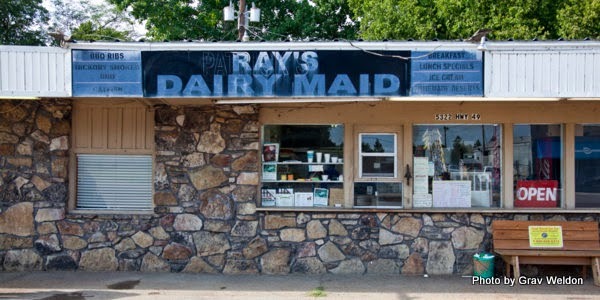 Arkansas and its Fading Restaurant History. 2013 Arkansas State Fair Food Preview.